On the evening of October 19, 2002, pediatrician Greg Gulbransen walked out his front door to move the family’s sport-utility vehicle into the driveway. Unbeknownst to him, his 2-year-old son Cameron followed. Gulbransen was backing up when he felt a small bump, discovering only after it was too late that he’d accidentally run over and killed the boy. Back-up accidents involving a small child inadvertently hurt or killed by a family member driving away from home happen all too frequently. Driving safety advocate Janette Fennell even has a name for them: the bye-bye syndrome. On March 31, 2014, the National Highway Transportation Safety Administration (NHTSA) finalized a long-delayed regulation meant to reduce back-overs, a key part of a 2007 driving safety act named for Cameron Gulbransen. According to the federal agency, the U.S. needs such a rule to curb the accidents, which result in 15,000 injuries a year and 210 deaths. Of those, 31 percent involve children under the age of 5. The regulation sets a 2018 deadline for rearview monitoring technology to be standard on passenger vehicles sold or leased in the United States. In most vehicles, the technology will consist of a back-up camera. Drivers don’t have to wait until 2018, though, to get a car with a camera that shows them what’s behind their back bumper. Ever since Nissan’s 2002 Infiniti Q45 became the first car in the United States to include a rearview camera, more manufacturers offer the gear as a standard or optional feature, for safety as well as convenience and better maneuverability. For the 2014 model year, 46 percent of vehicles sold in the United States include a back-up camera as standard equipment, according to separate estimates from the Insurance Institute of Highway Safety. People don’t buy a new car for the back-up camera, but if they’ve driven one with the device, it’s hard to go back to doing without, says Fennell, founder and president, which lobbied extensively for mandatory rear-view technology. “I flip out if I have to get a rental car without it,” she says. 1. Back-up camera systems will have to meet federal standards, but how they operate varies. The button-size devices are positioned so drivers can see people or objects that are otherwise undetectable using a side or rear-view mirror or by glancing over their shoulder. When NHTSA’s rear visibility regulation takes effect, it will require rearview technology to display a 10-by-20-foot area directly behind the vehicle. The rule also requires systems to show the driver an image of the area no more than 2 seconds after they put the vehicle into reverse. According to the rule, 10 percent of automakers’ new vehicles must have the equipment by May 1, 2016, 40 percent by May 1, 2017 and all models by May 1, 2018. 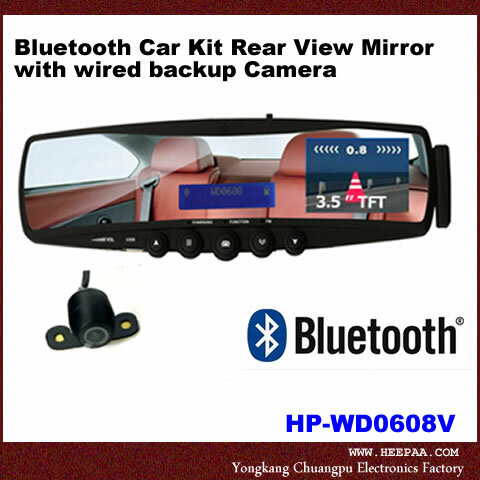 Back-up cameras send images to a display through wires inside the car, or in the case of some aftermarket equipment, wirelessly, using radio waves or a Bluetooth connection. Automakers configure back-up cameras to transmit images to a vehicle’s built-in dashboard display or rearview mirror. For add-on cameras, the images go to a monitor mounted to the dashboard and a receiver plugged into the auxiliary power. Current rearview cameras have either narrow or wide, fish-eye-style lenses, for capturing images of a larger area. Some automakers tuck the cameras out of the way until they’re needed, with an eye toward improving aerodynamics and design or to keep the lens clean. The Volkswagen CC , for example, houses a back-up camera behind the VW badge on the car’s trunk, just above the license plate. When the driver starts the car or puts it in reverse, the emblem flips open and the camera appears, like a cuckoo popping out of a clock. It retracts when the driver switches out of reverse or drives over 10 mph, says Thomas Zorn, Volkswagen Group of America’s general manager of safety affairs. 2. By several estimates, back-up cameras can help prevent accidents. In one recent study, close to 57 percent of drivers in vehicles equipped with back-up cameras avoided backing over a stationary object that had been placed behind the vehicle when they weren’t looking. The March 2014 research report from the Insurance Institute for Highway Safety (IIHS) also found that three-quarters of drivers in vehicles with both rear-view cameras and audible sensors avoided a back-over accident. By contrast, 100 percent of drivers in the IIHS study who were operating vehicles without back-up cameras or audible sensors ran over a child-size stationary object that had been surreptitiously placed behind them, according to David Zuby, chief research officer at the IIHS vehicle research center in Ruckersville, Virginia. “Our study adds to the body of evidence that’s been building over several years that cameras will help avoid some of these crashes,” Zuby says. NHTSA expects rearview visibility systems that meet the final regulations’ standards to be 28-33 percent more effective at avoiding back-over accidents than existing sensor-only systems. By 2054, when most U.S. vehicles on the road will have rearview systems, the technology should save 58-69 lives a year, according to data NHTSA released with the final rule. By that time, the agency estimates the total benefit from rearview technology to preventing injuries, saving lives and avoiding property should be $265 million to $396 million a year. 3. Cameras can add big costs to new cars. But it’s not really their fault. Initially, rearview cameras were part of optional bundles on vehicles’ costlier trim levels. One reason was that systems needed an in-dash display to work, and those screens only came on the most expensive models. Another reason, according to Fennell with KidsandCars.org, is that automakers know people like cameras, and so manufacturers have been attaching them to the highest trim levels. Adding an options package that includes rearview technology can indeed tack on several thousand dollars to the sticker price. For example, the starting price for the base trim level 2014 Volkswagen Passat 1.8T S, which doesn’t include a rearview camera, is $20,995. That compares to the starting price of $25,875 for the higher-end trim level 2014 Passat 1.8T SE, which includes a rearview camera, multifunction in-dash display, leather-wrapped steering wheel, aluminum-alloy wheels and all-weather tires and other upgrades. Ford’s suggested retail price for the base trim level 2105 Ford Fiesta S hatchback (1.6-liter, four-cylinder engine and five-speed manual transmission), which comes without a rear-view camera system, is $15,680, compared with a $19,630 sticker price for the higher trim level which bundles the camera system with such features as leather seats, heated mirrors and premium speakers. 4. Cameras are migrating to less expensive models and trim levels. Once they’re separated from other features, rearview camera systems aren’t that expensive. NHTSA estimates that adding back-up cameras and displays that comply with the new regulations will cost manufacturers $132-$142 more per vehicle, or $43-$45 for vehicles with an existing screen that can display the required image field. Perhaps in anticipation of the mandatory-equipment regulation, rearview systems are migrating down from manufacturers’ top models and trim levels. 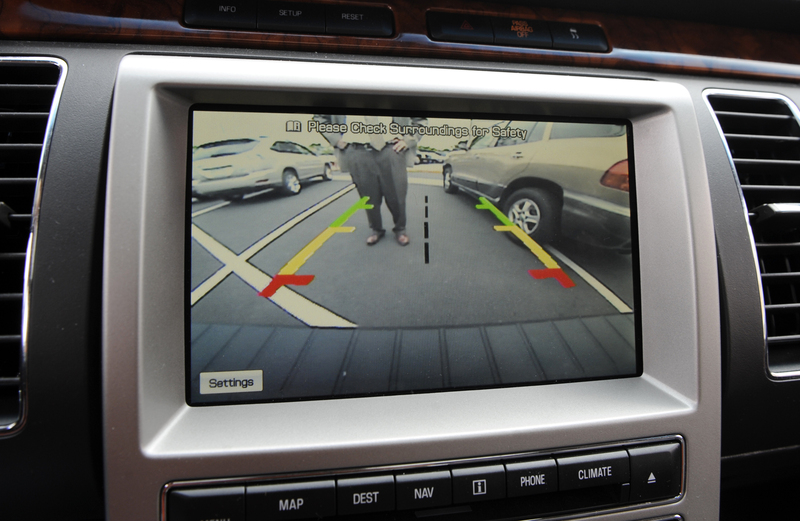 Close to half of all 2014 model-year cars include back-up cameras as standard equipment. Of 2,359 styles included in Edmunds.com’s database of 2014 vehicles, 1,007 have back-up cameras as standard equipment. Here is a complete list of 2014 model-year cars that have rear-view cameras as standard equipment. It also shows the camera-equipped 2015 models on the market now. Shoppers will find cameras as standard equipment in such moderately priced top sellers as the 2014 Honda Civic, including base LX trim level, and the base L trim level of the 2014 Toyota Camry. So far, though, they haven’t found their way to several of the least expensive vehicles on the market, or the lowest trim levels of some popular cars. For example, you can find rearview cameras on some trim levels of the 2014 Toyota Corolla, but not on any 2014 Toyota Yaris. The thrifty 2014 Kia Rio has a rearview camera as standard equipment in the top-of-the-line SX trim level, but it’s not available (even as an option) on the base LX trim level. The 2014 Chevrolet Sonic LTZ, the model’s top trim level, has a rearview camera as standard equipment. But don’t look for it in the base LS trim level. You won’t find a camera in the diminutive 2014 Chevrolet Spark. Ditto for the budget-friendly 2014 Nissan Versa. 5. Adding a back-up camera is fairly easily. You don’t need to buy a new car to get a back-up camera, though, or spend a lot to add one to an existing vehicle sell aftermarket systems for less than $15 for a bottom-of-the-line stand-alone camera for vehicles that have existing in-dash displays. A complete setup with a camera, transmitter and display can run up to $300. One aftermarket system is the QuickVu, a $259 system with a rear-view camera that mounts to the license plate holder and uses radio signals to transmit images from up to 50-60 feet in back of a vehicle to a 3.5-inch monitor mounted on the dash, and digital signals to turn the system on and off. Installing a back-up camera on an existing car isn’t difficult. Some require only a screwdriver, while others require a drill to mount the camera into a rear bumper cover. Some aftermarket camera makers post videos on their Web sites to help DIYers with step-by-step set up instructions, and many auto parts retailers do installations. 6. Grime, weather and time of day can affect how a camera functions. Whether they’re factory installed or aftermarket equipment, rearview cameras don’t need much more maintenance than a periodic wipe-down to clear away accumulated grime from the camera lens. In heavy rain or snow, auto company representatives and aftermarket camera sellers suggest checking before you drive off to make sure the lens isn’t obscured. Some automakers have come up with clever ways to keep rearview cameras clean. Select 2014 Nissan Altima, 2014 Nissan Rogue and 2014 Nissan Murano models have a built-in rearview camera cleaning system that sprays water from a small tank to clean the lens, and then squirts a puff of air to dry it. Manufacturers also instruct auto dealers to give anyone buying a new or used car with a back-up camera system a walkthrough of the system before they drive off the lot so they understand how it works. 7. Back-up cameras may prevent accidents, but they might not lead to lower insurance rates. NHTSA and IIHS may be convinced that rearview systems save lives, but auto insurers could take decades to adjust rates for customers who use them, and one insurance industry representative says even if rates drop, the decrease could be tiny. For insurers to give discounts, insurance actuaries would have to compare data from sufficiently large pools of vehicles with and without the systems to determine whether the cameras make a difference. That won’t happen any time soon, since NHTSA predicts it will be 2054 before all U.S. cars on the road have back-up systems, says Loretta Worters, vice president of the Insurance Information Institute, an industry trade group. In addition, once all U.S. vehicles have rearview systems, the equipment is expected to save a relatively small number of lives — fewer than 70 a year — compared with tens of thousands of people killed in traffic accidents. As a result, any rate decrease could amount to “well under $1 per policy,” Worters says. Instead, technologies such as collision avoidance systems and telematics show more promise for providing trackable data that could lead to lower insurance rates, she says. At least one insurer sees things a little differently. According to State Farm spokesman Sevag Sarkissian, back-up cameras could lead to lower car insurance rates if makes and models that have them wind up in fewer accidents. State Farm doesn’t provide discounts for specific vehicle safety equipment, but does collect claims information for specific makes and models, Sarkissian says. “To the extent a specific type of vehicle safety technology that is standard on a particular make and model of vehicle is effective in reducing the frequency and severity of crashes, it will be reflected in our claims data,” he says. As a result, particular makes and models may have lower insurance premiums, he says. 8. Back-up cameras are helpful for more than avoiding accidents. Wait until you see the camera technology that’s coming next. Though intended to serve as safety devices, back-up cameras also can be used to help drivers do a better job of backing into a parking spot or hitching a trailer. Nissan offers an around-view monitoring system on certain 2014 Pathfinder, Quest, Rogue and Versa Note models that comprises four cameras mounted on the license plate holder, front grille and side mirrors. The setup is designed to be a parking aid and has become a big selling point, according to Nissan. Customers “are typically wowed by the feature,” says Baehner, the Nissan manager. “Most of our research shows they are highly desired features.” Once you have them, they want them, he says. Ford’s highly touted all-aluminum 2015 F-150 truck will also feature four cameras — on the front grille, rear bumper and side mirrors — for better maneuverability, with images transmitted to an 8-inch touchscreen in-dash display. Aftermarket camera manufacturer Trail Ridge Technologies LLC, in Fort Collins, Colorado, is working on an upgraded, all-digital version of the company’s QuickVu device that will work over Bluetooth. The company is also developing an all-digital back-up camera system for trucks and RVs that will show more than 50 feet behind a vehicle, and can be used for hitching a trailer. Trail Ridge owner Bob Morain expects the updated systems to be out in summer 2014. In coming model years, expect to see automakers adding other types of cameras to cars, SUVs and trucks for maneuverability, better aerodynamics and fun. At 2014 auto shows, Land Rover made a splash with a concept off-road vehicle with a hood-mounted camera that captures pictures of upcoming terrain and feeds them to a head-up display at the bottom of the windshield to create a 3-D map. Also at 2014 auto shows, Nissan showed a concept version of the Rogue with a rear-view “smart” mirror, an LCD display that doubles as a back-up camera. The company plans to offer the smart rear-view mirror in Japan later in 2014, and in other markets at an as-yet-undisclosed date, according to company officials. Tesla is experimenting with replacing side-view mirrors with cameras to improve vehicles’ aerodynamics and fuel efficiency. The company and the Alliance of Automobile Manufacturers have filed petitions with NHTSA seeking permission to use cameras in place of side-view mirrors, which are required under U.S. auto safety laws. Volkswagen recently got an exemption from European auto safety rules to road test 200 XL1 concept cars that have cameras instead of side-view mirrors. The goal: to see how side-view cameras work, and whether drivers like them, says Zorn, the company’s safety affairs general manager. If you drive a big car or an SUV, it can be difficult to see what’s going on behind you when you’re backing up or what’s ahead at ground level when you’re parking. Many of the car makers have added parking sensors, backup cameras and 360 degree cameras to help. Additionally, thousands of kids are the victims of “backovers” every year. The problem is so serious that the HNTSA is now requiring every new car to include a back up camera system by 2018. You don’t have to wait or buy a new car to get this technology, though. Backup cameras are now available from your local expert. Of course, just a camera isn’t useful unless there’s a screen in your car that can be used to display the camera’s view. If your head unit includes a video screen, there may be a video input designed to accept the input from a backup camera. If you are using a factory head unit with a screen, there may be an adapter available that adds that video input. If not, an additional screen can be installed. There are even replacement rear view mirrors that include a video screen that can display the camera view. A 360-degree camera system includes an on screen view of the back, both sides and the front of the vehicle. This can be very helpful when you’re parking or checking your blind spot before changing lanes. Additionally, there are systems that can sense an impact to the vehicle and record video around the car just like a video surveillance system for your house. In addition to offering convenience while you drive, these camera systems also provide increased safety for those in and around your car while you’re backing up and provide additional security while your vehicle is parked. If you don’t need all that security, but you would find some help with parking, there’s a parking sensor solution that doesn’t require a video screen. A parking sensor system will alert you as your car approaches an obstacle either in front or behind while you’re parking. The systems use indicator lights and warning tones that increase in intensity as your proximity to obstacles is reduced. This can be very helpful in preventing the front of your car from being damaged by curbs and parking barriers. They also help to prevent backovers, because the sensors will also detect people and animals. Portable dash cameras are designed to hang from the windshield or to be attached to the top of the dashboard. They begin recording when you start your car and stop recording when you turn off the ignition. They are designed to record everything that happens in front of your car while you drive. The video is stored on a built-in or removable storage device and the recording is a loop. After the memory is full, the device begins writing over the oldest saved video. Dash cams can be useful in helping you remember what happened in a crash or a near miss. They also provide proof that can help you file an insurance claim if the incident is recorded on video. Your local expert can help you find the right system to be integrated into your existing system or into an upgraded system no matter how old your car is.